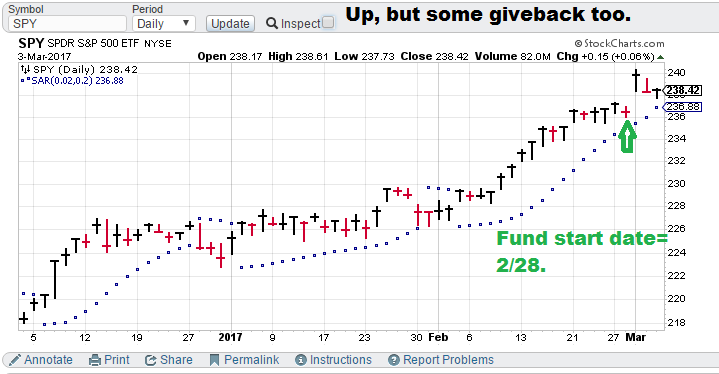 Hedge Fund stats: Start Date= 2/28, Total start value= $20,088.93. Current holdings TBT (450 shares, current price $41.72, total value=$21,434.45). Inception-to-date = +6.70% (less than a month!). Model notes: Initially the models had to help us answer 2 questions, choose an asset class, choose a direction. How did we do? 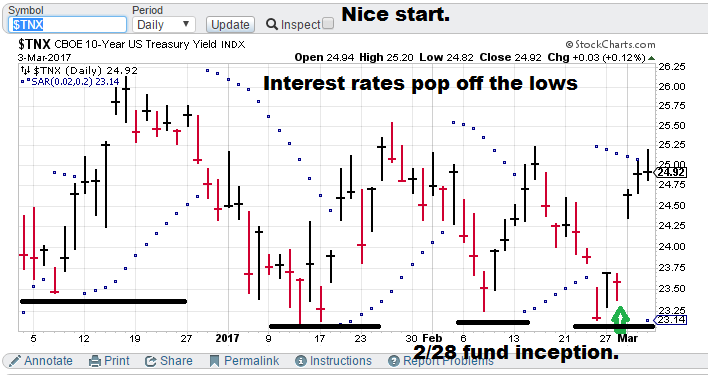 The models signaled bonds with the direction down (put another way, long yields, hence the TBT). The charts below indicate we made the right choice. There is a cherry on the sundae as well. Last week on CNBC, Melissa Lee questioned hot-hand-manager David Tepper as to whether he was short bonds. Tepper’s terse response was, “You bet your hiney!” Nonlinear analysis has us on the same side of the bond market as David Tepper. Long Yields ($TNX): Yields continue to climb, and that is great. The $TNX is now near the highs of December (26.25-ish). So now what? 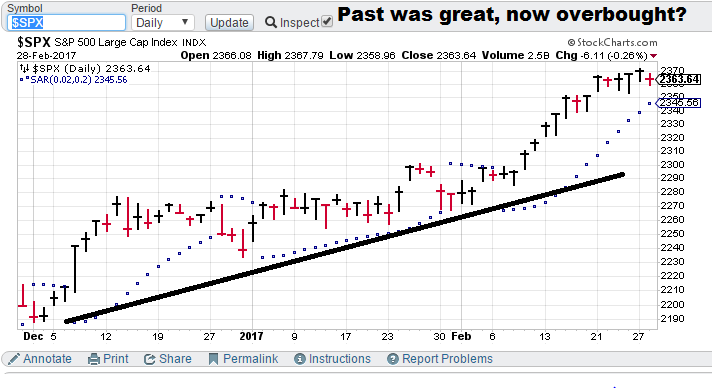 Nonlinear analysis is still bullish. If you look at this as a trading range, the advantage is with the rate bulls. Other factors to consider are: the Fed is now hawkish on rates and Trump-o-nomics is adding a lot of enthusiasm about an economic rebound. The position looks good. 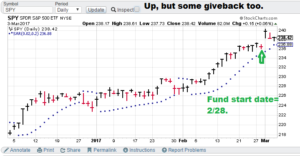 Neutral Stocks (counter factual, $SPX): Bluchips jumped on the first day of March but has been met with low amplitude selling since. You are starting to see some in the media start to pose this may be a reversal. My indicators are not showing that yet, instead we are simply pausing after a considerable, earlier bounce. Hedge Fund stats: Start Date= 2/28, Total start value= $20,088.93. Current holdings TBT (450 shares, current price $40.18, total value=$20,741.45). YTD return (Also inception-to-date) = +3.25% (less than a week!). 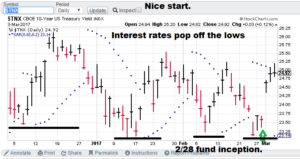 Model notes: Interest rates advanced sending the fund up. +3.25% is a good 3-day start. Nonlinear analysis is still on our side. Long Yields ($TNX): The pop in government rates was helped by both technical and nonlinear analysis. 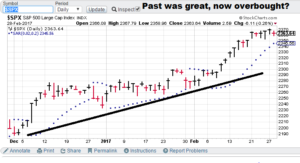 The TA is the result of a range bound market bouncing off the bottom of the range. Nonlinear analysis shows the “risk” of a breakout is greater than a breakdown. Add in the fundamental backdrop of the Fed becoming increasingly hawkish and the perceived business pros of Trump-o-nomics, the position looks good. Neutral Stocks (counter factual, SPY): Bluchips jumped but also fell on some selling. Initially the choice of going long interest rates on a pull back vs the possibility of going long overbought stocks seems … smart. Hedge Fund stats: Start Date= 2/28, Total value= $20,088.93 (86.76% invested, 13.24% cash), holdings TBT (450 shares, current price $38.73). YTD return= 0%. Model notes: The general strategy is to bounce the portfolio between cash and several major asset classes. Currently I am tracking stocks (S&P 500) and Government bonds (or yields). We could see several more to follow. The current portfolio is heavily bullish government yields. Long Yields ($TNX): When you are investing, you look at the past but you must envision the future. 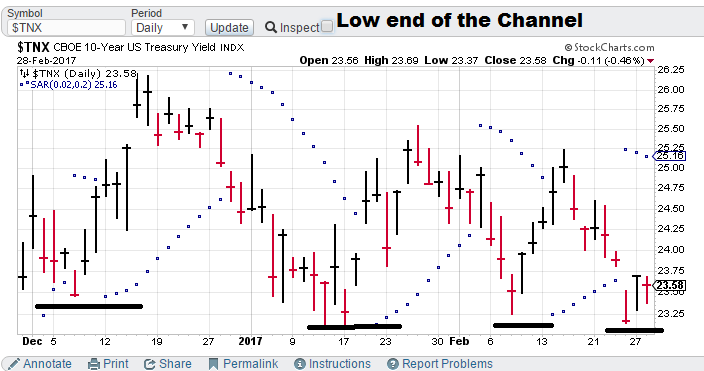 Yields are at the low end of a range they have been bouncing around in during the last 3 months. Fundamentals are a plus here too, Fed sees higher rates and the economy feels like it might be revving up. Upside potential here. Neutral Stocks (counter factual, SPY): Stocks have been trending up for the last 3 months. They may very well go higher, but equities could underperform as they have already moved strongly up. 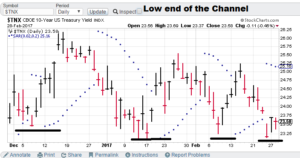 Yields to out perform? Observation: Is it just me, or would our premium ranking signals make a great (moderately priced) addition to any hedge fund strategy? Don’t sit around your Monday morning meetings giving each other high-fives with a two-star strategy on the books. Nonlinear portfolio construction can give you an edge. Contact me for more info. Click the ‘Ranking’ tab to find out additional info. By the way, in 2017, I am only going to take on 4 clients! We are now offering asset class ranking (or alternatively sector ranking), using our trading signal technology on a longer timeframe. This is an exciting new product as portfolio construction has one glaring, missing puzzle piece: what asset classes will continue to outperform/advance for next month? Get your independent research here, put my 25+ years of model building experience to work for you!